When you’re zooming through Spaghetti Junction for most of the day when there’s no traffic, it might seem like the tangle of highway ramps isn’t really that big. Or if you’re stuck in construction traffic, it might seem like it never ends. Speed has a way of distorting our sense of distance. But the reality is that Spaghetti Junction is an enormous part of our physical built environment in Downtown, Butchertown, and beyond. And while much of it is hidden behind unsightly industry, mini-storage, or barren lots, when you see the junction from the sky, its scale really begins to stand out. 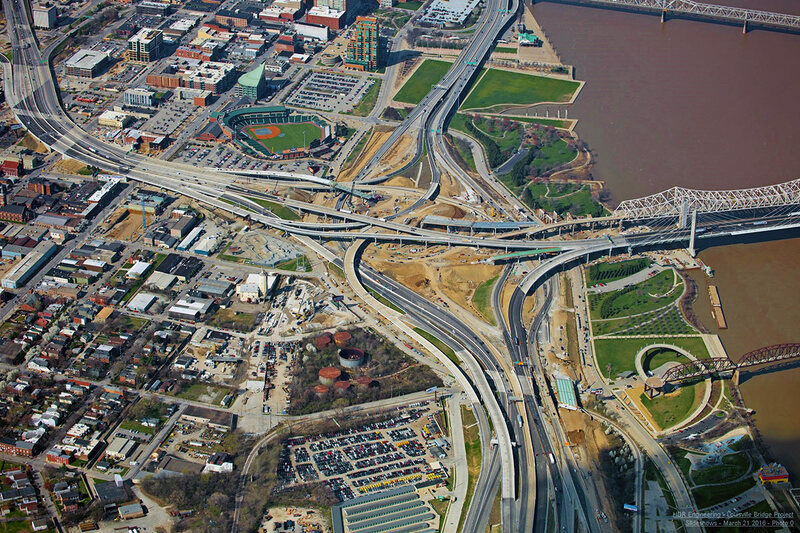 The Downtown Crossing segment of the Ohio River Bridges Project (ORBP) recently shared these aerial views of the junction taken this spring by HDR Engineering, and it’s apparent you could fit a large chunk of Downtown Louisville within the bounds of the highway. For instance, Spaghetti Junction would stretch from Ninth Street to Floyd Street and from Main Street to Liberty if laid across the grid east to west. Placing it north to south would span from Main Street to past York Street. That’s a long ways. I still to this day have no idea why 8664 was not chosen for the cost savings alone. To divert downtown 64 traffic along 265 and remove the behemoth elevated expressway, opening the downtown area to a new waterfront boulevard and possible future waterfront economic development would have been a massive boon for the city. Its too bad that we instead opted for a multi billion dollar project that included a several hundred million dollar tunnel under the yard of a rich persons house. UPS and the distribution industry in Kentucky want more infrastructure, not less (http://www.greaterlouisville.com/logistics/). They (the industry) are not concerned with the livability of downtown Louisville. As they always same, follow the money. You’ll find your answer. How depressing. What a poor use of money and space, and a detriment to our fair city and its residents. It’s about corporate short-term gain (i.e. quarter over quarter profit), not long term gain let alone sustainability. I’m not sure what the purpose of this story is. We are stuck with this project because politicians in the past didn’t have the guts to do what was right. We definitely needed the East End bridge, almost everybody agrees to that. We didn’t need the downtown bridge, almost everybody agrees to that except Mayor Abramson and a couple of his friends from Prospect who thought by throwing that into the project would kill the East End bridge which it didn’t. There’s been much discussion about what the best solution would of been in unfortunately there isn’t a great agreement on that. Everybody pretty much does agree however that what we ended up with isn’t the best solution. What we need to do now is it figure out ways to make the best of what we’ve got! Complaining about it certainly isn’t going to help and we know better than to think it’s ever going to get torn down before it wears out (if even then). I’ve seen ideas here and elsewhere for ways to make downtime more accessible and usable. Ideas to extend the Kentucky side of the Big 4 Bridge with pedestrian routes into Butchertown in downtown have been presented here and certainly seem like a good place to start. Everyone needs to get behind one plan and push for it to be completed instead of having fractured groups push for everything different. I still cant believe this happened, such a tragedy. I’ve never seen a large city make so many poor planning decision. And in the top level corner is the Yum Arena; located in the most ill advised location.